On Thursday's, I tend to look at ideas that have worked in the past. Den doodles have been around as long as there has been the organization of the dens in Cub Scouts. It is the one tool, besides the back of their book, which the scouts are able to measure up their progress. This great visual aid sometimes creates a desire within the scout to complete more achievements to build up his own cord on the doodle. Also, in some circumstances, it may create some competition between the scouts to see who’s cord has more bling on the doodle (didn’t someone important once say that scouting is a game with a purpose… oh yah, Baden Powell said that). When creating your den doodle, do not do all the work. This is for the boys, so naturally it should be them who designs the doodle. You as the leaders are the ones who keep it updated and you may be surprised at how proud your Cub Scouts are as they slip something as little as a pony bead onto their own cord of accomplishments. A den doodle can proudly take its place beside the den flag at the pack meeting. If it’s a good den doodle, it’s distinctive. No two doodles should look alike, but every doodle should have the dens number and totem, a place for each member’s name, and a cord or thong for each Cub Scouts string of achievements. Spools, bottle tops, and Popsicle sticks are a few of the usual trophies used to show the completion of an achievement. Whatever the den chooses from then on, all members use the same trophy to mark their triumphs – each one should be marked with the achievement number and date. This month's theme is Cooperation. It's Pack Meeting time! One way to have your pack on time is to have a gathering activity. This month's gathering activity for me will be putting together a puzzle as a group. Also, I will have a baseball crossword puzzle (we are going with the sports theme of the month) for the parents to work on with their scouts. the process of working together to the same end. You might be saying to yourself... "It's still January! Why am a seeing February's pack planning?" The most memorable and enjoyable meetings are those that are planned in advance. February's core value is Resourcefulness. Have activities for the Cub Scouts that will help them understand resourcefulness in different situations. February is also usually the month to hold your Blue and Gold Banquet. Involve your Pack Committee now in the planning. Some items that should be considered for your banquet: Where will we hold it, What will we eat, Who will decorate, What will make it fun and memorable? This is a perfect theme to coincide with New Years Resolutions. 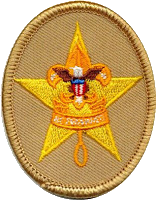 As we follow the points of the Scout Law... It reminds us to always have a positive attitude and to be helpful, friendly, kind, and cheerful. As CubScouts we are reminded to be positive with the motto - DO YOUR BEST! Cub Leaders: The following is the January pack planning guide provided by National. This is not a complete step by step resource but it does get the ball rolling with the creativity on your part as a Cub Leader. Remember you don't have to be perfect...just "DO YOUR BEST!" The core value for October is Responsibility. October is also Fire Safety month. Contact your local fire department early in the month to have a representative in attendance for your pack meeting. One of the challenges of being the Cubmaster is making the pack meeting fun. We suggest that you use the September Pack Meeting Resource Sheet to get started. With fall sports starting to come into full swing, your gathering activity could involve a quick game involving a soccer ball or football. The point is to make it fun so the boys have a desire to arrive at pack meeting early.